Click the image above to view/download the camp flyer. Registration is open until the day of the camp without any late fee. Please come and join this great opportunity to enhance your karate skills, spirit and mental focus. The cost is $60 for all sessions.Students may also drop-in for any of the sessions for $20 per session, or half-day (AM or PM) for $40. At-Door registration is available with no additional charge. Click the image on the right to view/download the training schedule and sign-up form in PDF. Traditional Japanese karate-do ("the way of karate") is a martial art which originated in the ancient samurai's training and education designed to develop and strengthen personal integrity, discipline and character. It is a form of moving meditation in order to achieve a higher level of awareness and focus, to balance the body and the mind, and to cultivate good leadership and judgement skills. Traditional karate practice consists of kihon (basics), kata (forms) and kumite (sparring). Our karate is non-contact, meaning no physical contact ("hit") is permitted during any of the practice including sparring. Our chief instructor, Sensei Akihiro Omi, is a 7th degree blackbelt with 40 years of experience in karate. 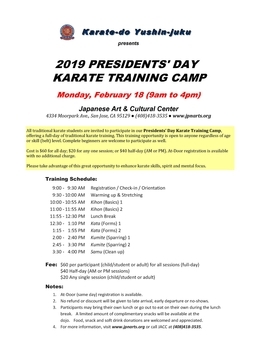 Born in Japan as a descendant of a samurai family, Sensei Omi started his karate training at age 15, studied under many legendary Shotokan karate masters both in Japan and in the United States. He served as president of the Northern California Karate-do Federation, a member of the technical committee for the U.S.A. National Karate-do Federation (USA Karate), and an international referee/judge for the Pan American Karate Federation (PKF) as well as the World Karate Federation (WKF). Yushin-juku Difference: Our karate classes focus on character development rather than tournament competition or military-style discipline you might find in other so-called karate schools which can negatively affect students' personality formation and judgement skills while stripping away their self-esteem while overinflating ego. Instead, we use the power of encouragement, compassion and tolerance to guide each student to achieve their life's goals. We accept student as young as age 4, some even younger. 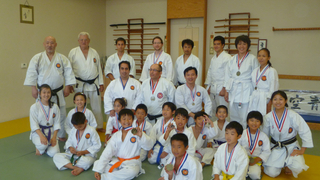 We welcome both complete beginners and people with previous experience in karate or other martial arts. Please feel free to come and watch or take a free trial lesson at any time; no appointment is necessary. There is no long-term contract; no monthly or annual fee; membership is free. You only pay for the classes you attend, either by dropping in or by purchasing a 10-lesson punch card. Visit our Yushin-juku Karate Facebook Group page! Free Trial Lesson is available. No long-term contract or commitment necessary. No enrollment fee, annual fee or monthly fee. * indicates blackbelt tests are also available. To register, fill out the application form, detach and give the bottom portion to the JACC receptionist with $65 test fee (check or cash only please) on or before the day of the test. We cannot take credit cards for belt tests. Please make all checks payable to "Yushin-juku". Candidates should attend 1:00pm class to review their test requirements. The actual test will start around 2:30pm and will end around 4:00pm. * Blackbelt Exams are scheduled only twice a year in May and October. Make-up blackbelt exams are available in June & November for those who had to miss or failed to pass.